Nowadays, there are now also suitable scales for via ferratas They may differ from region to region, but two evaluation systems have nevertheless established themselves: the Hüseler and the Schall scale. They primarily differ in that Hüseler uses verbal classification and Schall uses letter classification. The easiest level of difficulty corresponds to the letter A or the statement of “less difficult”, while the highest level of difficulty corresponds to E or “extremely difficult”. The development towards the ever more demanding via ferratas has led to a new level of difficulty with F. At present, there are just two category F via ferratas in the alpine region - the arena version of the Bürgeralm via ferrata and the F version of the Postalm via ferrata in Austria. The requirements of ability and equipment are also clearly defined for the via ferrata scales. For example, although experienced via ferrata climbers get by without a via ferrata set at the start, it becomes a necessity the more difficult it gets. There are now several extreme via ferratas that go beyond the scale. It is important to find out in advance what the conditions and requirements are for the ascent to be climbed. 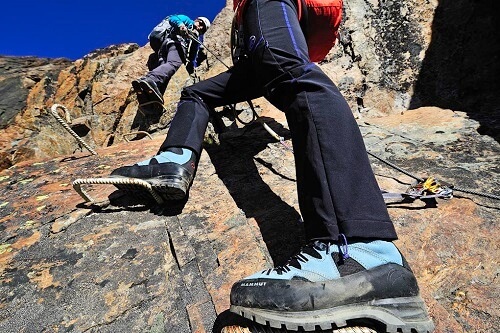 In addition to the levels of difficulty for via ferratas, there are also comparable scales for hiking tours, mountaineering, ski tours, snowshoe hikes, climbing and bouldering and mountain bike trails. Easy K1 Flat to steep, mostly rocky or interspersed with rocks, exposed passages possible Wire ropes, chains, iron clamps, individual short ladders. Ascent is largely possible without the use of safety devices. Steady footing and a head for heights recommended Via ferrata equipment recommended. Experienced walkers may not require safety equipment. Very difficult K4 Vertical, often overhanging terrain, mostly very exposed Wire rope, iron clamps and stepping pins are often far apart. On exposed and steep places often just a wire rope. Enough strength in arms and hands, as longer vertical to overhanging areas and smaller climbing areas up to II /UIAA) possible. Via ferrata equipment obligatory, even experienced via ferrata climbers may require the use of a rope. Not suitable for beginners and children! Extremely difficult K5 Vertical to overhanging, exposed throughout, very small steps or slab climbing Wire rope, iron clamps and stepping pins are often far apart. On exposed and steep places often just a wire rope. Often combined with scrambling. A lot of strength in hands (fingers), arms and legs, increased level of condition, mobility. Via ferrata equipment obligatory, rope teamwork is worth considering, especially when touring places without safety devices. Not suitable for beginners and children! > Extremely difficult K6 Primarily overhanging, exposed, very small steps or slab climbing Wire rope, iron clamps and stepping pins are often far apart. Combined with scrambling. Good climbing technique is imperative, a lot of strength in hands (fingers), arms and legs, increased level of condition, mobility Via ferrata equipment obligatory, top rope climbing equipment recommend. Not recommend for people who cannot manage difficulty level E without problems.